At midnight on New Year's Day, Germans everywhere clinck glasses and say "Prosit Neujahr" - meaning "May the new year turn out well." 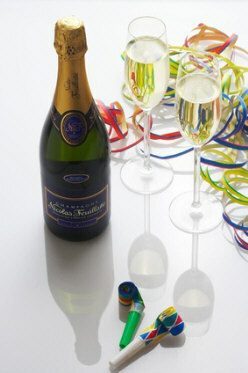 Keeping to this same theme, Germans follow many traditions on New Year's Eve to try to bring about that good new year. Here we discuss some of those popular food traditions and their meanings. Eating Sauerkraut on New Year's Eve is a long-standing tradition in Germany. It is believed that eating Sauerkraut will bring blessings and wealth for the new year. Before the meal, those seated at the table wish each other as much goodness and money as the number of shreds of cabbage in the pot of Sauerkraut. Seafood for dinner (evening meal) on New Year's Eve has been a long-standing tradition. Particularly popular is the New Year Eve Carp (Silvesterkarpfen). The carp can be baked, pan-fried, grilled, or smoked. Other seafood, such as trout, salmon, crab, sturgeon, eel, lobster, crayfish, and oysters, are also favorites on New Year's Eve. It is not really known how this tradition started. However, one theory is that people wanted to cut their caloric intact after all the Christmas celebrations and food, so they chose less fattening food, seafood, for their New Year's Eve celebration. In the past, carp was always an expensive and hard to find fish. Because of this, it was greatly valued and a superstitition evolved around it. It was believed that a fish scale from the carp hidden in one's wallet brought an abundance of money. The scale had to remain in the wallet the entire year and could not be removed. Likewise, scales hidden throughout the house brought this same abundance of money to the entire family. This custom is still followed today by many Germans. The pig has long been a symbol for good luck and well-being. Because of this, many people believe that eating a meal with pork will bring luck in the coming new year. Such meals include pork Schnitzel, Bratwurst made with pork, any kind of wurst made with pork, pork roast, Sauerkraut with Kassler Rippchen, etc. For those who prefer not to eat pork on New Year's Eve, a sweet alternative, such as Marzipan-Pigs (Marzipanschweine) or pig-shaped chocolates, is believed to bring the same benefits. Poultry is never eaten on New Year's Eve in Germany. According to a very old superstition, anyone who eats poultry on New Year's Eve loses his happiness. It is believed that all good luck and happiness fly away with the bird's feathers. Despite this superstition, those in the Rhineland (Rheinland) eat goose (Neujahrsgans) on this day. Perhaps the most popular New Year's Eve meal is a bowl of soup: lentil soup (Linsensuppe), pea soup (Erbsensuppe), bean soup (Bohnensuppe), or carrot soup (Möhrensuppe). According to a long-standing tradition, these soups are supposed to bring blessings and wealth for the new year. Also, a fully-eaten bowl of lentil soup is supposed to guarantee plenty of small change in one's pocket. A tradition in Saxony, specifically in the Ore Mountain region, on New Year's Eve is to place some salt and bread under a tablecloth and keep it overnight into New Year's Day. This is believed to prevent any times of hunger in the coming year. 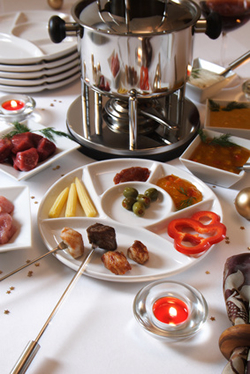 A newer tradition in Germany is to enjoy a fondue or Raclette with family and guests on New Year's Eve. Cheese Fondue A variety of cheeses are melted with spices and wine. Guests dip bread cubes into the melted cheese mixture. Meat Fondue This is the most popular kind of fondue in Germany. Small cubes of raw meat are placed onto long fondue forks and dunked into hot oil until cooked. The cooked meat is dipped into various spicy sauces before eating. Chinese Fondue Similar to the meat fondue, except instead of cooking the meat cubes in oil, they are cooked in broth. Spicy sauces are used for dipping the cooked meat. Vegetable Fondue Guest place bite sized vegetables onto their elongated fondue fork. The vegetables are dipped into a batter, then placed in the fondue pot, where they are fried in hot oil. Chocolate Fondue A dessert fondue. Guests dunk fruits into melted chocolate. Raclette is similar to a cheese fondue in that it involves melting cheese. Here, a special appliance, an electric Raclette grill, is used to melt individual portions of cheese. The melted cheese portions are then served to guests, who add their own seasoning, vegetables (such as boiled potatoes, cucumbers, onions, and tomatoes), and bread. There are many baked goods that are popular for New Year's Eve. Particularly important is the New Year's Bread (Neujahrsbrot). This is gifted to friends and family as both a symbol and a wish that the receivers have plenty of bread without sickness and sorrow in the coming year. Formed breads and cakes, such as New Year's pretzels, braids, and wreaths, are also popular during this time because of what they are believed to represent. Pretzels and wreaths are thought to represent togetherness, limitlessness, luck, and blessings. In Germany, each family has its own food traditions for New Year's Eve celebrations. Here we list some popular food for New Year's.